The controversial Australia star was speaking in Brisbane this morning ahead of next weekend’s first Test. 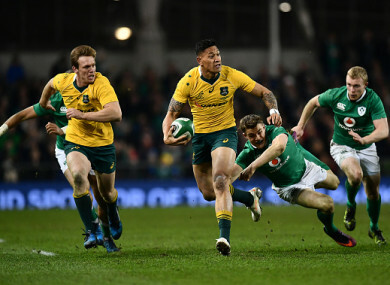 Folau in action against Ireland back in 2016. STANDING BENEATH THE facade of Brisbane’s Suncorp Stadium — the venue for Saturday’s opening Test between Ireland and Australia — controversial Wallabies star Israel Folau admitted he doesn’t know ‘too much’ about Joe Schmidt’s side. Ireland arrived on the Gold Coast yesterday as one of the in-form sides in the world having negotiated the last 12 months unbeaten en route to a Grand Slam title and a second-place position in the World Rugby rankings. But when Folau, who has played against Ireland three times, most recently in Australia’s 27-24 defeat at the Aviva Stadium in November 2016, was asked what he expects from the tourists, the fullback said: “To be honest, I don’t really know too much about the Ireland side. To be fair, Folau has been busy in the build-up to the Test series with the Waratahs, who saw off the Reds in a thrilling Super Rugby clash yesterday, a game in which the 29-year-old starred. Folau, who has been embroiled in a storm since posting anti-gay sentiments on social media last month, showed his aerial ability with a superb piece of athleticism to score a crucial try for his side on the stroke of half-time. “It was a pin-point kick from Bernard and those are the type of skills we work on in training and obviously just glad it came off in a game last night,” he said, before explaining that scoring tries won’t be a problem for the Wallabies. “It’s great that we have guys who can get over the line and score tries, putting points on the board is not a problem for us. “We’ve got strike players in the team who can score points and that’s probably a strength of ours at this time. Wallabies coach Michael Cheika was in attendance at the Suncorp Stadium and will be encouraged by the form of the likes of Bernard Foley, Kurtley Beale and Folau heading into Saturday’s series opener. Australia host Schmidt’s side, who continued preparations for the summer Tests with a gym session at their Gold Coast base this morning, on three consecutive Saturdays in Brisbane, Melbourne and Sydney. Email “Folau: 'I don't really know too much about Ireland'”. Feedback on “Folau: 'I don't really know too much about Ireland'”.